1. Paint little green footprints on the desks. Do this when your students are out of the room. When they come inside and realize that a leprechaun has 'visited' their room, they will get super excited! 2. Turn the tables and chairs upside down. In addition to increasing the excitement of a magical visit, this also is a great discussion starter for a leprechaun description by emphasizing how naughty and tricky leprechauns are. 3. Hide gold (chocolate) coins around the room. This is a wonderful activity. Not only can you discuss the myth of the leprechaun hiding gold in a pot at the end of the rainbow, but you can also use the collected gold to 'share' equally amongst your students, add the different-sized coins or use it to discuss word problems, e.g. "The leprechaun had 100 pieces of gold. He hid 25 pieces in our classroom. How many does he have left?" 4. Sit a little toy leprechaun on a high shelf. It is a great surprise when the students notice the leprechaun 'watching' the fun (i.e. All the excitement in the room!) In the past, my students have 'named' their leprechaun, written stories about him and I have often transformed him into a behavior management tool, e.g. He is 'looked after' by a well-behaved student for a day etc. 5. 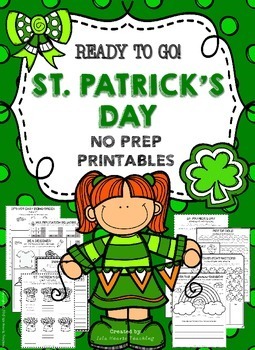 Check out this fun St. Patrick's Day Printable packet! With 50 pages of fun St. Patrick's Day fun, it can be found HERE!